This past week I was weeding in the flower garden one lovely evening, when I heard a little buzz in my ear. I brushed it away, as I would any annoyance, but then numerous stings on my body occurred. My first thought was red ants, but then I saw it was bees. Down my shirt, down my jeans. A planned attack! I must’ve plunged my weeding tool into their nest in the ground, or damn near it. . . I just read that the best thing to do in case of a bee attack is to run like hell (don’t roll around the ground)! Head for the house! That I did, while stripping down. Luckily, there are no neighbors around! They were tenacious little buggers, following me all the way to the house, but, thankfully, none made it inside. Once safe, I assessed the damage–10 stings in all in very painful places. I made a baking soda and water paste and that helped soothe the pain, but not my pride. These little bees had definitely put me in my place! And I also felt bad that I may have destroyed their nest. Every bee is precious these days. 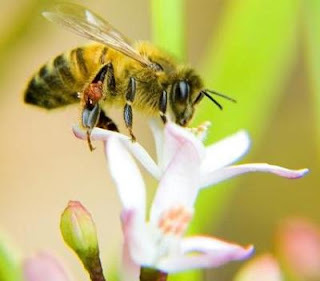 They are the world’s great pollinators. And Colony Collapse is a real and frightening epidemic. We all have to do what we can to save the bees. So, please, put down the herbicides (and pesticides) and pick up your weeding tool. Just be careful where you dig!